Listening to: the thread of a tale, voice music, history, mystery, action conveyed through words direct into heart and ears, eyes and mind. Teller and Audience merge in the story exchange. The St. Louis Storytelling Festival is the largest free storytelling festival in the world. Celebrating its 40th year, for all ages of humankind, the alchemy of this event strikes sparks around our Big River town. 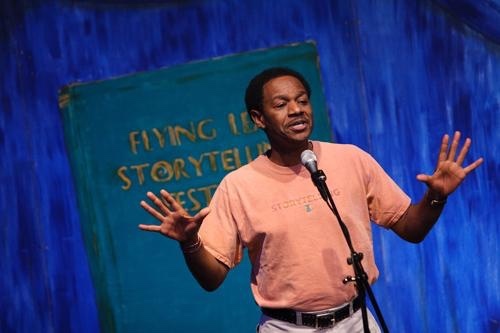 Tellers of international to local renown will take their tales to public and special venues April 25 - May 4, 2019. 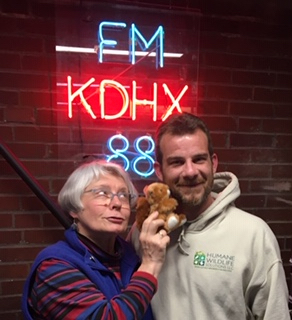 Current and former festival directors Lisa Overholser and Nan Kammann-Judd bring their love of this interaction to the Earthworms studio - and the festival brings a night of Irish tales to The Stage at KDHX on Tuesday, April 30. Throughout time, people have preserved their culture, values, and beliefs through storytelling. 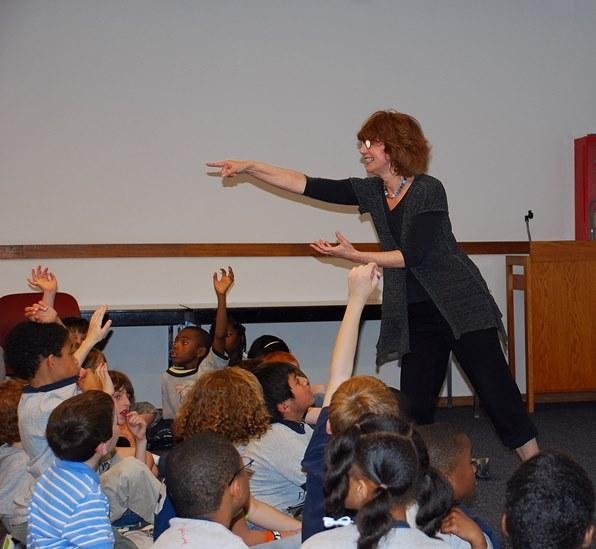 Giving voice to the human experience, storytelling allows families and communities to pass on their history to succeeding generations, and it remains an evolving, dynamic art form. 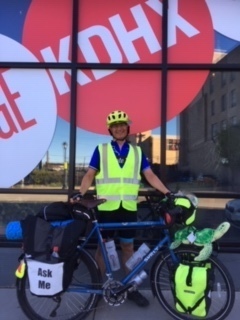 Mid-way along his marathon cycling trip from CA to MA, Tim Oey is educating humans of all ages about: Oceans, Plastic, Climate Change and Kids. 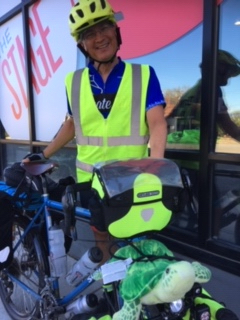 His two wheeling fleet travel mode packs everything he needs, with (as is his life practice) ZERO WASTE. Tim's stop here with KDHX Earthworms followed three talks this morning at our neighboring Performing Arts Academy. 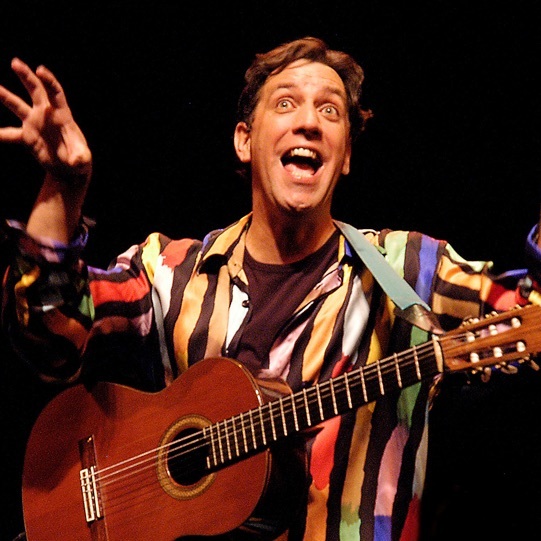 He's on track for his goal of 180 talks in 95 days. Some are presentations, many are conversations. All are likely - as you can hear - thoughtful, encouraging, and gently intense about serious stuff. Thanks to Andy Heaslet, Earthworms Green-living engineer. 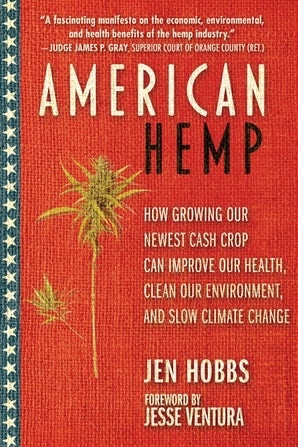 American Hemp, the new book from Earthworms guest Jen Hobbs (Skyhorse Publishing, 2019), details "how growing our newest cash crop can improve our health, clean our environment, and slow climate change." 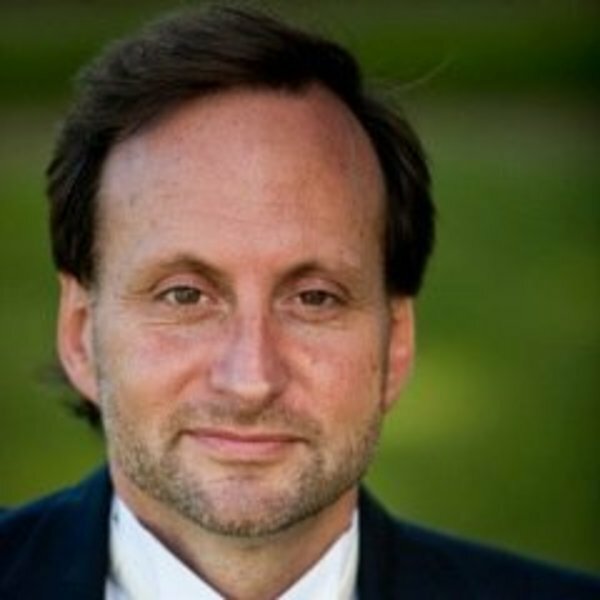 Hobbs details these claims for a plant brought to North America by British colonists, banned and pressed into service and banned again, and now legalized by the 2018 Farm Bill. 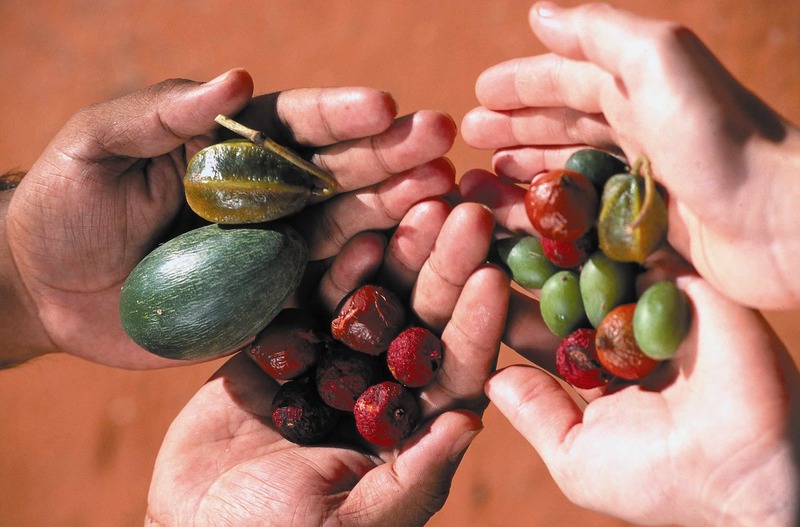 Its seeds are a superfood. Its stalks house you in "HempCrete." Its oil, the substance CBD, can calm anxiety, control seizures, and more. 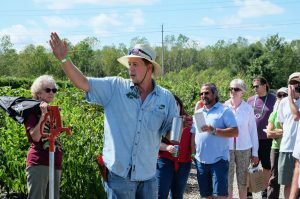 With real potentials for this flowering plant to earn as much as $30K per acre, its story is growing fast. You say you've got squirrels in your attic. Garry Guinn says you've got a hole in your house, and works with you to secure a fix that benefits both the critters and you. 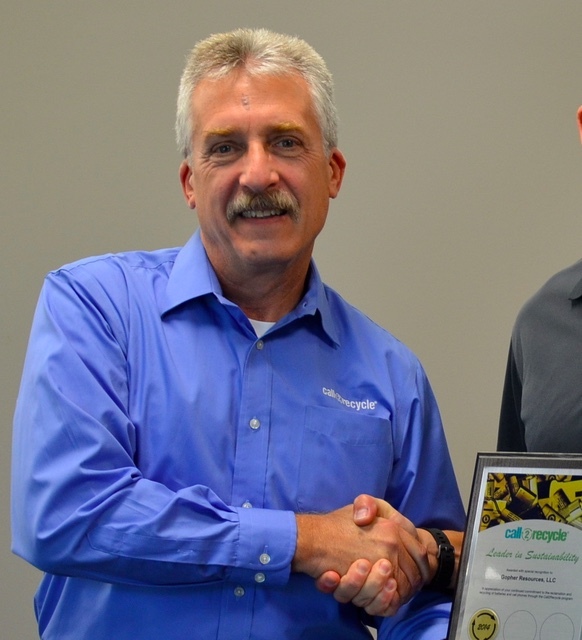 Garry's business, Humane Wildlife Solutions LLC runs on eco-logic with super Green cred: this St. Louis enterprise endorsed by all the wildlife agencies in town! 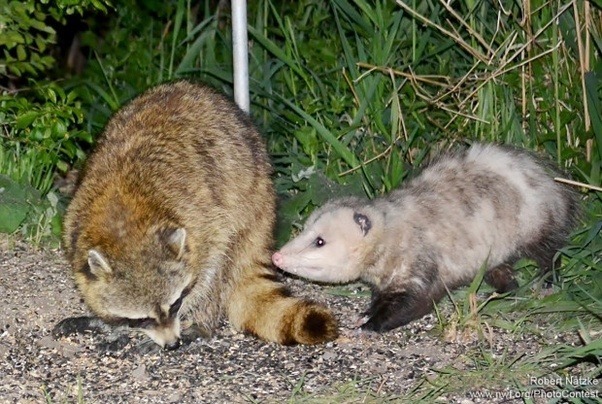 His practices like "exclusion and eviction" apply his deep understanding of animal behavior, including the animals (us) who call him to deal with their "pests." Note that "extermination" does not need to be on this action list, for a company that gives a multi-month guarantee of problem-solving success! 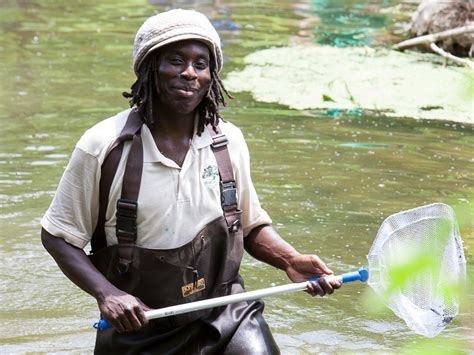 Meet Garry Guinn and Humane Wildlife Solutions LLC at the Green Living Festival - Saturday June 1 - Missouri Botanical Garden. 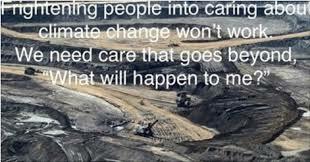 A power plant burns coal to produce electricity. As with any other combustion, ash remains. This ash is typically stored in "ponds" near the plant. What do ponds do? The fill up, they overflow, they leak into groundwater. 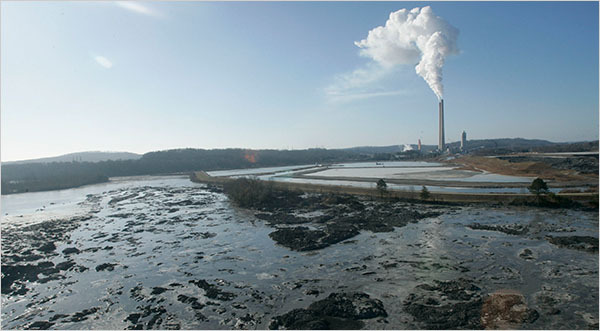 With coal ash in this flow, toxics like Arsenic, Lead, Molybdenum, Mercury and more get into our water supplies. LEO, the Labadie Environmental Organization, has been tracking and acting on Missouri coal ash issues for more than 11 years. LEO organizers Patricia Schuba and Janet Dittrich bring to this Earthworms edition research, observations and an urgent request to YOU to weigh in as MO-Dept of Natural Resources develops a plan to present to US EPA. Groups like LEO across the country are working to hold power plants responsible for cleaning up coal ash ponds, and managing coal combustion waste responsibly. 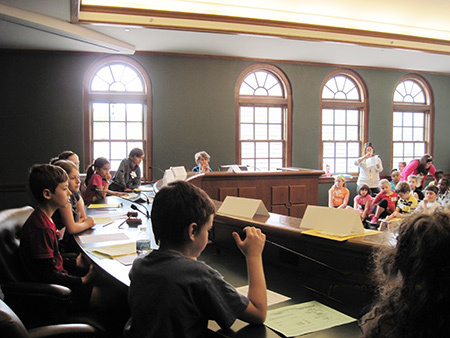 In Missouri, a public comment period through March 28 gives citizens the chance to comment on MO-Dept of Natural Resources proposal to regulate coal ash. You can sign a LEO petition through March 21. Check out related coverage by Eli Chen of St. Louis Public Radio. A lot of enviro-info dis-credits our human species for the impacts of our "footprints" on Earth's systems, and on beings other than ourselves. 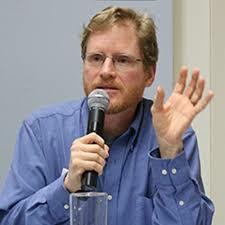 Scientist and public health advocate Greg Norris was inspired, while working with Life Cycle Analyses, to look up from Footprints and focus on the human part that can collaborate, create and restore. 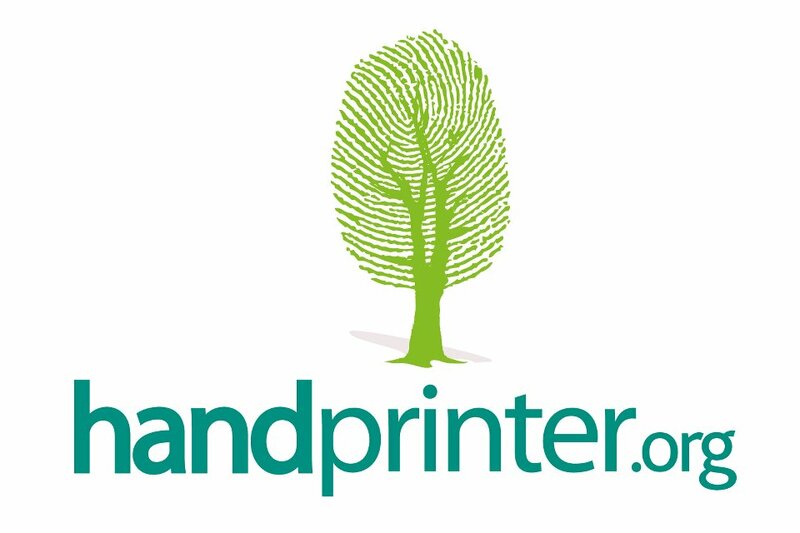 "Handprinting" has become a vehicle to encourage and measure our capacity to be a benefit on Earth. Beneficial actions - and the ripples of influence they create - can now be measured through a key piece of Norris' work-in-progress, the app Handprinter.org. This tool and idea aim to ensure that Earth is better off because of human beings, than without us. You too can BEE one! 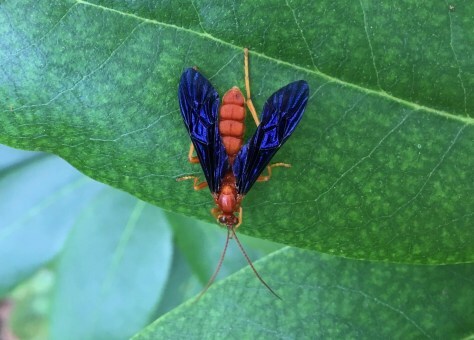 Or Taconite Fly or Opossum or Golden Ragwort one, gardening on an eco-logical team with critters and plants you've overlooked, or maybe even maligned. Nancy Lawson invites us to understand more of the habits and roles of species around us, to bust the dualistic myth of Pest vs Beneficial. 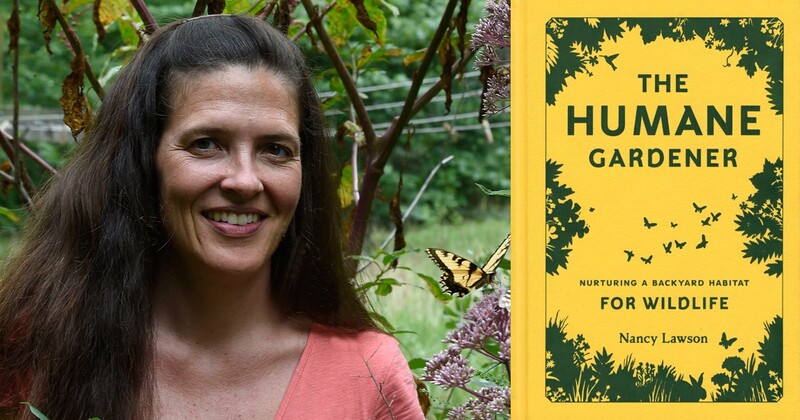 Her book The Humane Gardener: Nurturing a Backyard Habitat for Wildlife is a long love note to relationships we can all enjoy. Such as with Tachinid Flies. 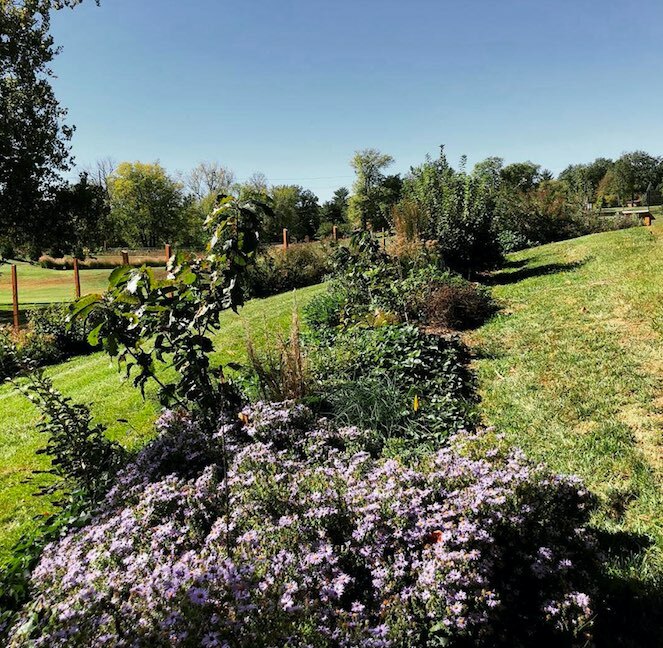 Coming to St. Louis Friday March 8: Nurturing Backyard Habitat, a talk-and-mingle with Nancy Lawson and local native plant professionals, 5-8 p.m. at Powder Valley Nature Center. Click here to learn more and register. 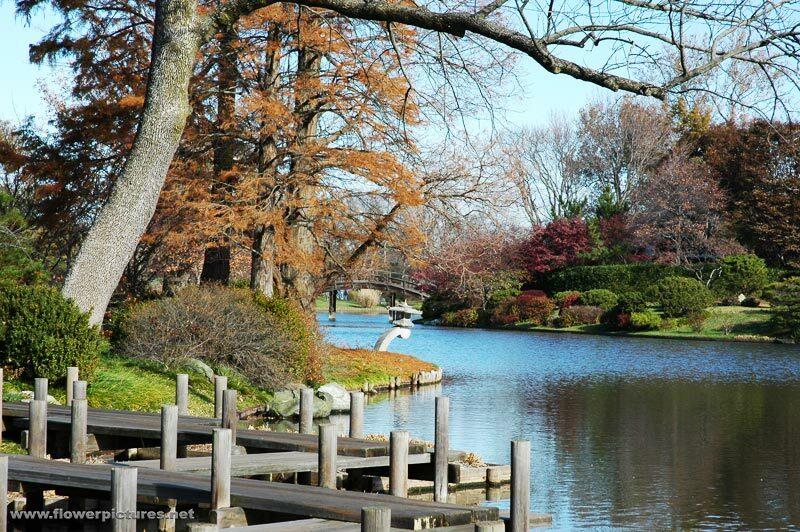 Thanks to STL Audubon, Greenscape Gardens, Missouri Department of Conservation and Grow Native! for bringing Nancy Lawson to us. THANKS to Andy Heaslet, Earthworms engineer and listening buddy. 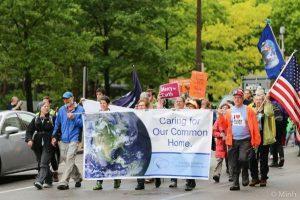 In 2015, Pope Francis message about Climate Change called on people of faith world-wide - not only Roman Catholics - to take action to protect Earth's resources. A St. Louis consortium of Catholic parents, students and leaders is calling this community to convene, learn, strategize and respond. This edition of Earthworms talks about why, and how, this response is growing. 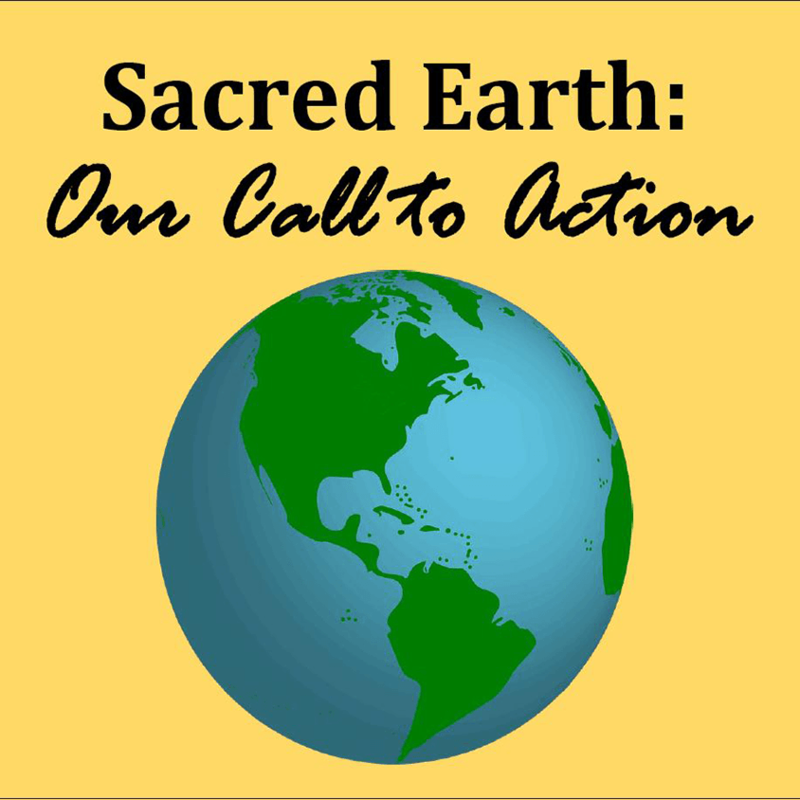 Sacred Earth: Our Call to Action Conference, Saturday March 9 9 am - 2:30 pm, hosted by Nerinx Hall High School. Guests Jamie Hasemeier of Holy Redeemer Parish, Mark Etling from St. Nicholas Parish, and Maggie Hannick of St. Joseph's Academy are conveners, with other partners, of this conference. So you know the "Three Rs," right? Recycle is the famous one, but #1 in this trio (REDUCE) deserves more creative attention and - use! 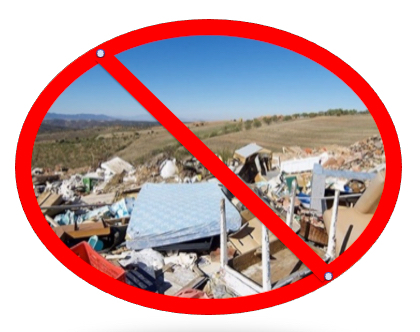 In a recent blog post, recycling professional Kelley Dennings considered why the recycling community may be ditching out on waste reduction. 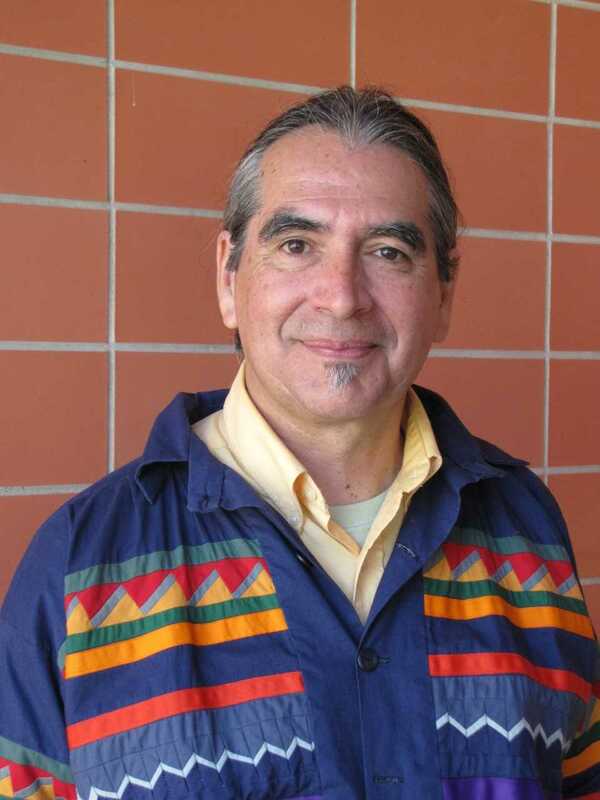 Dennings serves as Advisor to NewDream.org, one of Earthworms' favorite educational orgs. 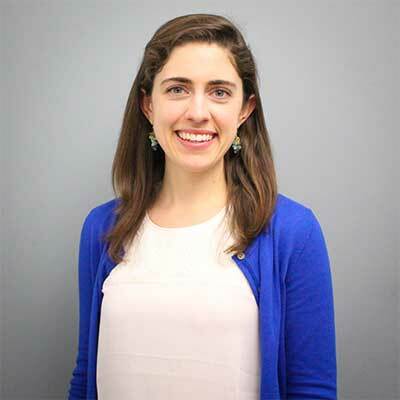 When Dennigs added a degree in Public Health to her credentials and influence potential, she framed the sort of off-putting Reduce idea of in the human-centered focus of Prevention. Could this be a way to get our species to explore more New Dream's territory? Their motto: More Fun - Less Stuff! Resources that come up in this Earthworms conversation include New Dream's So Kind Alternative Gift Registry, an E-Z online way to request and give day-of-event help, shared experiences, homemade and secondhand gifts - and more. Plus references to Zero Waste, Scrap Exchange, Product Stewardship Institute and other Reduce-Reuse activity in the Waste Space. Getting modern humans out of our house-car-school-work boxes is no small feat. But whenever that may occur, our tall, spreading, leafy neighbors have what it takes to help our kind be more of our best selves. Potentials are TREE-mendous! 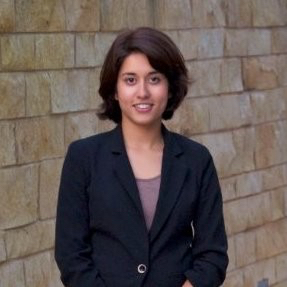 Writer Andrea Sarubbi Fareshteh enjoys "Forest Bathing" and researching good stories, facts and quotes. 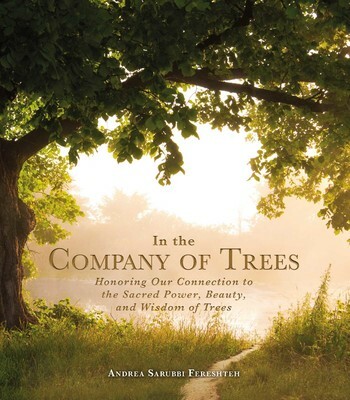 She has composed a gorgeous new book In The Company of Trees - Honoring Our Connection to the Sacred Power, Beauty and Wisdom of Trees (Adams/Simon and Schuster, Jan. 15 2019). Each tree tale is illustrated with a color photograph, print or woodcut - in a work of art published in accord with Sustainable Forestry Initiative guidelines. Earthworms is proud to host the first interview for this book! 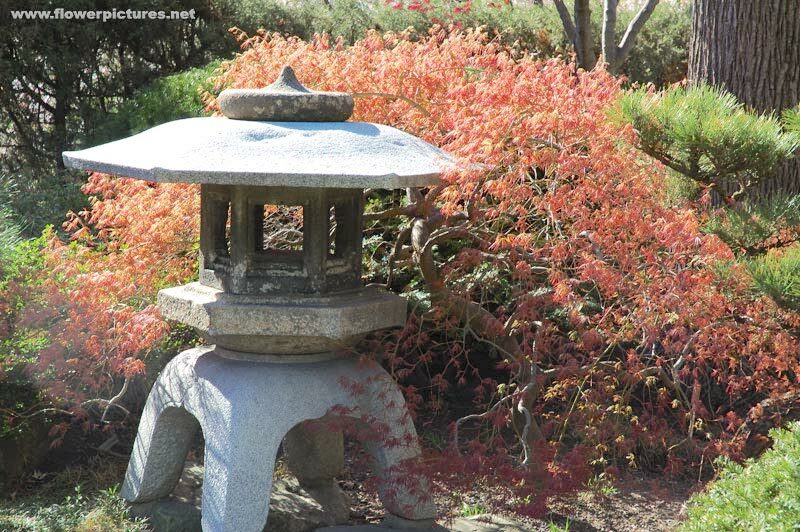 If you are hearing this podcast in St. Louis before February 12, mark that date to learn about Calculating Tree Benefits in a free program at Missouri Botanical Garden in the BiodiverseCity STL Wild Ideas Worth Sharing Speaker Series. Tree Data is MOTIVATING! Renegotiated by Congress every 5-7 years The Farm Bill impacts food production, nutrition assistance, habitat conservation, international trade, and much more. But try digging into its 1,000+ pages! 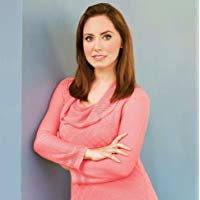 Christina Badaracco, a registered dietician, dug deep into this topic for her new book (with researcher and author Daniel Imhoff) The Farm Bill: A Citizen's Guide (Island Press, Jan 2019). She brings perspective from this accessible, graphics-rich book to this Earthworms conversation. With a new farm bill just signed into law, we all need to understand the implications of food policy. What’s the impact of crop insurance? How does SNAP actually work? What would it take to create a healthier, more sustainable food system? 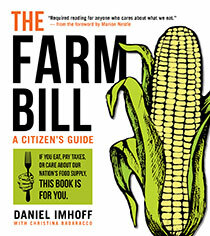 Eaters, taxpayers, sustainable food system advocates: listen up! Thanks to Andy Heaslet, warmly welcomed back this week as Earthworms' engineer. 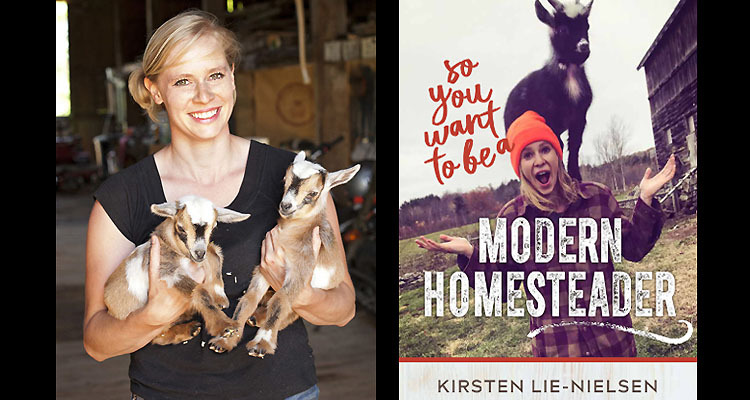 Kirsten Lie-Nielsen lives her dream of self-sufficiency in rural Maine - and shares the experience in her new book, So You Want to be a Modern Homesteader? (New Society, 2018). 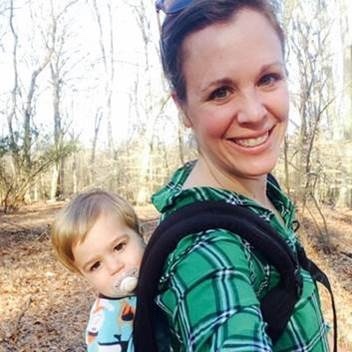 From finding the home place to prioritizing work and funds to enjoying the community flow when neighbors drop in, Kirsten covers options with practicality and a smile in her voice. Her goats are never far from the phone! 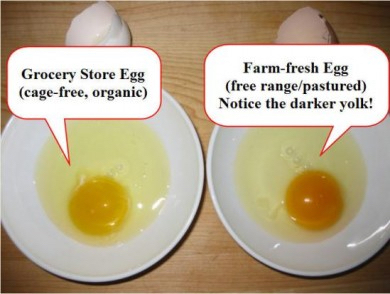 Check out Kirsten's blog at hostilevalleyliving.com. Music: Cuttin' at the Point, performed live at KDHX by The Freight Hoppers. Special THANKS tonight to Anna Holland, Earthworms audio engineer for the past year+. We say farewell with this edition, Anna, appreciating the media professional you already are, and wishing you the BEST in your next round of College work. It was especially fun to have your perspectives on Citizenship on the show we produced right after the 2018 Election. Forest ReLEAF of MO - 25 Years, 200,000 Trees! 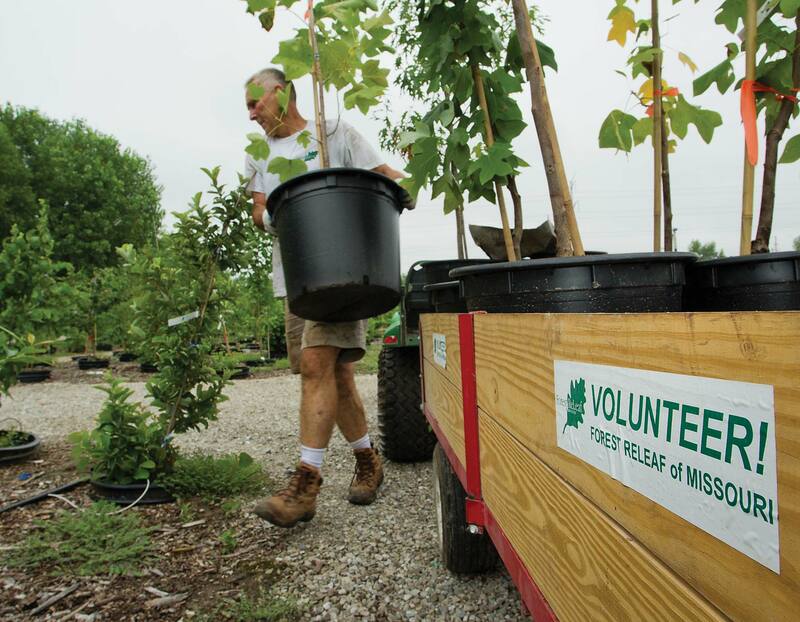 In their super-service quarter-century, Forest ReLEAF of Missouri has moved over 200,000 native species trees from seedlings to nursery transplants to solid ground in communities around the Show-Me-State. ReLEAF works with Seniors to Young Friends to community folks. 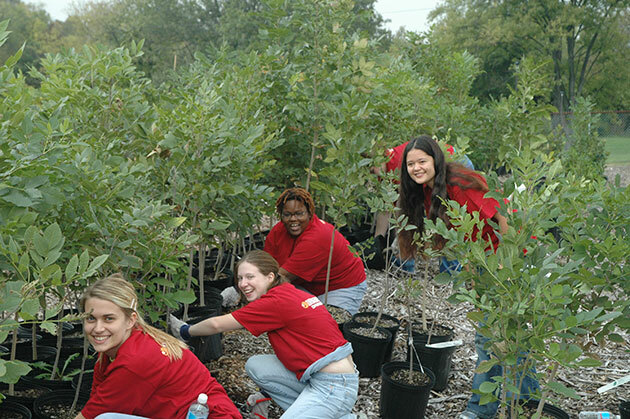 This intrepid non-profit trains and supports volunteer powered efforts to grow, track and maintain healthy Urban Forests. 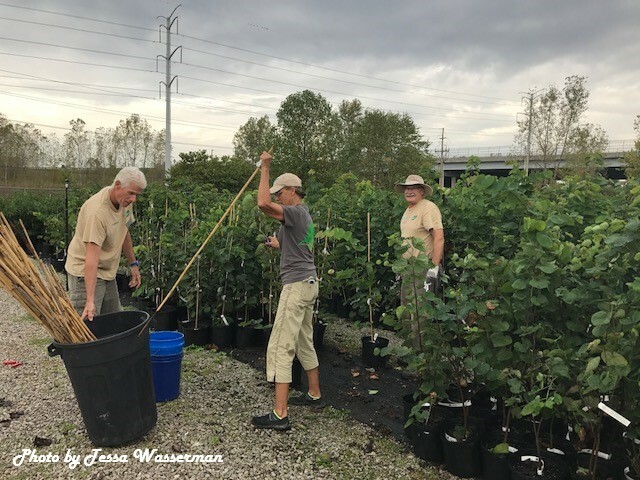 Community Forester Tom Ebeling talks with Earthworms host Jean Ponzi (some of her best friends are Trees) about this work, in a conversation celebrating ReLEAF's 25th anniversary and the many benefits of urban trees. 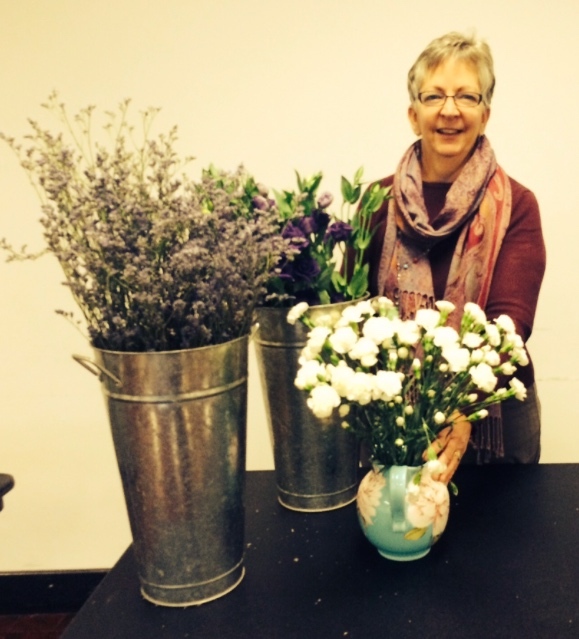 If this interview inspires you to check out ReLEAF volunteer opportunities, don't resist! The work will grow on you. Want to eat your home landscape? 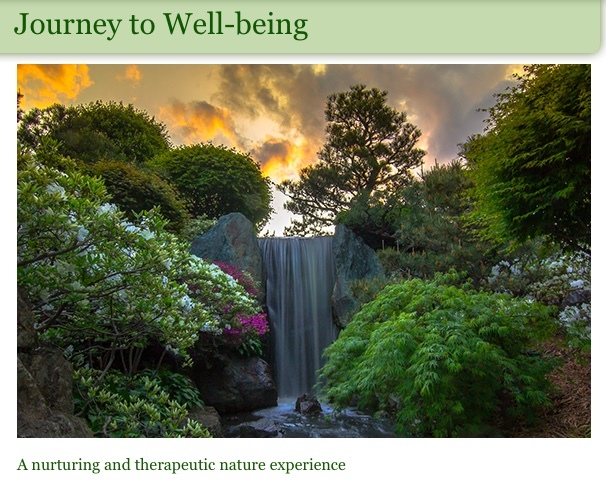 Want to work with Nature in some of the most efficient, effective and - Yes, EASIEST ways? 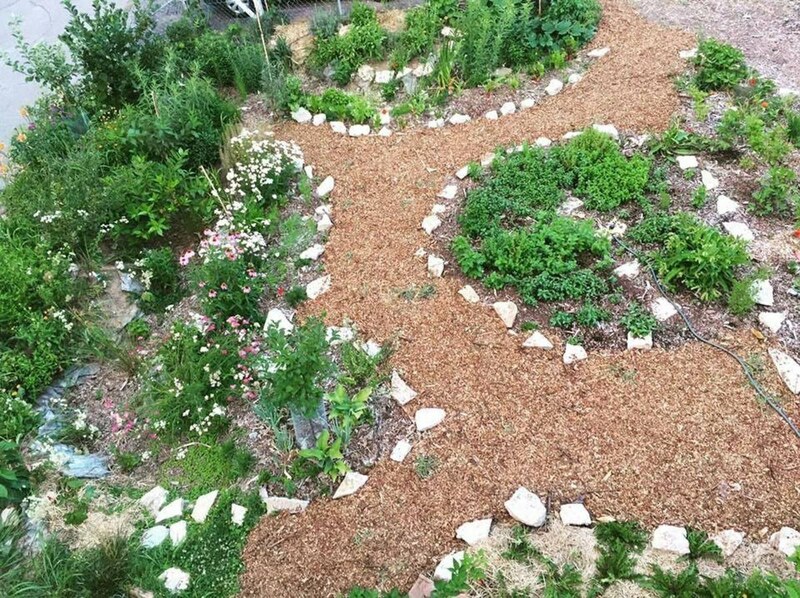 Farmer and Permaculture practitioner Matt Lebon will set up your place to grow a feast for you - and for your bug-bird-nature neighbors. 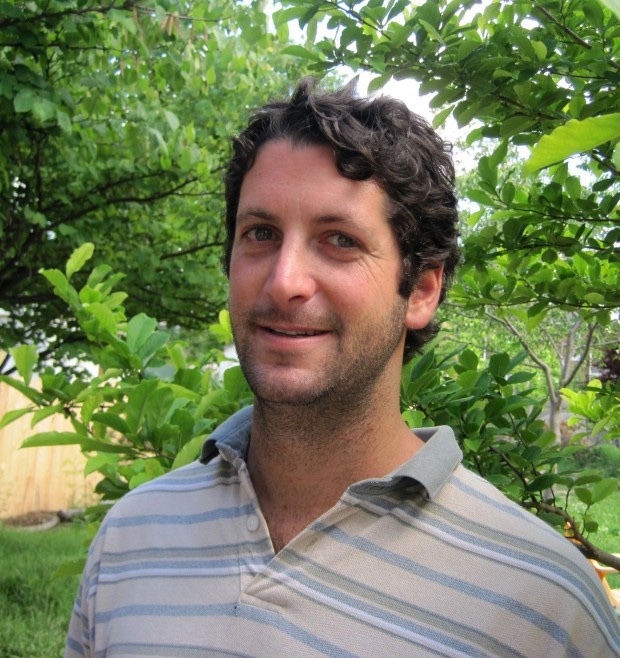 Matt recently parlayed his five years of deep experience as manager of our town's EarthDance Organic Farm (home of the Farmer Training School) into his innovative enterprise Custom Foodscaping. 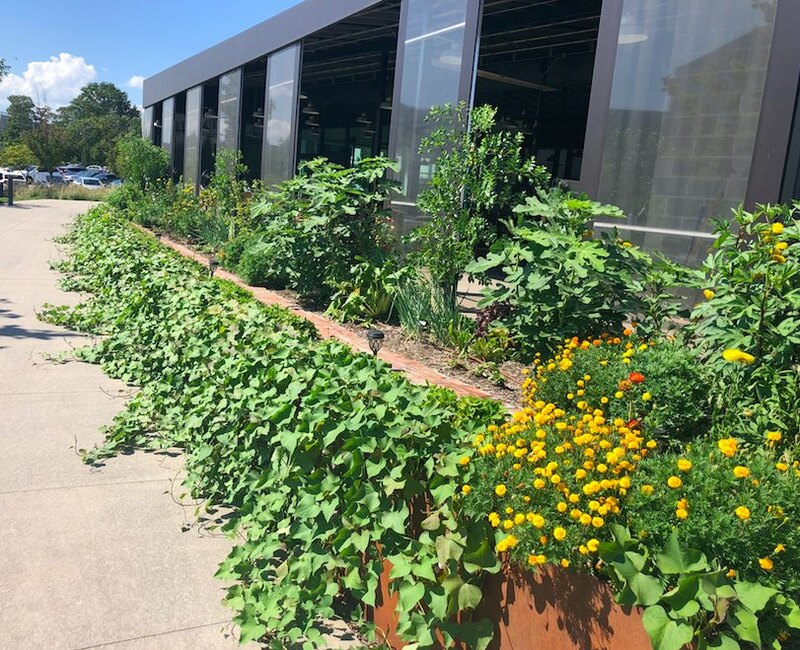 He can design and plant a custom edible landscaping package for home or business customers, or work with you hands-on to help develop your own Herb Garden, Food Forest or profitable Vegetable Farm. Matt's enthusiastic skills can produce Edible Schoolyards to Chef's Gardens to Taste-Full Home Gardens. As he says, "Have your landscape and eat it too!" Photos of Foodscape at VICIA Restaurant, Permaculture Orchard at Principia College, Chicken Food Forest at a private home. THANKS to Anna Holland, Earthworms audio engineer. 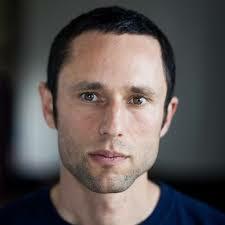 Social philosopher and mathematician Charles Eisenstein takes on the issue of our time, in terms that may give humankind another way to get our minds, hearts and action around Climate Change. 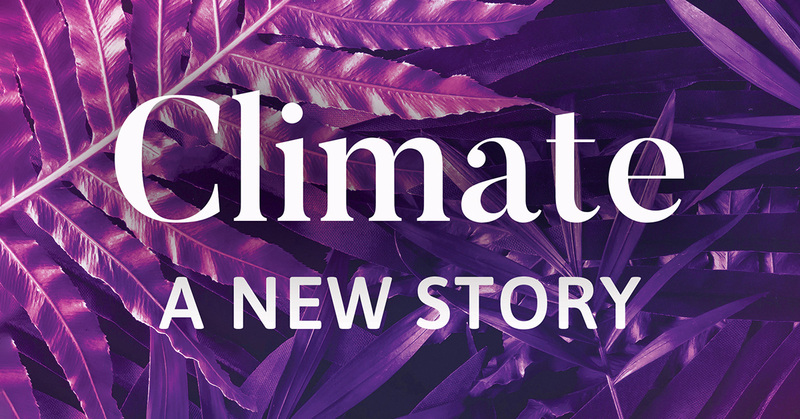 Drawing from Eisenstein's new book Climate, A New Story, this conversation with Earthworms host Jean Ponzi offers perspective, options and much-needed hope for our species capacity to course-correct relative to the systems that support life on Earth, including us. Music: Abdiel, performed live at KDHX by Dave Black. What does "Citizenship" mean - and how can we revive, revitalize and re-energize it in society today? Earthworms host Jean Ponzi explores Citizenship ideas and options with guests David Wilson - longtime regional sustainability professional who has led Citizenship Education Clearinghouse, MO Coalition for the Environment, and the OneSTL Regional Sustainability Plan process for East-West Gateway Council of Governments - and Anna Holland - student at Lewis & Clark College, volunteer for the 2018 Illinois Congressional campaign of Betsy Londrigan - and Earthworms audio engineer! Citizens - Listen Up! Thank you! Missouri Coalition for the Environment's Ed Smith, Policy Director, and Water Policy Coordinator Maisah Khan present a report on current energy, water and pollution-related issues from the St. Louis Region. This update covers potential EPA Superfund resolutions to the radioactive-material contaminated West Lake Landfill, clean-up proposals for lead contamination in the Big River, and more fine work from MCE. 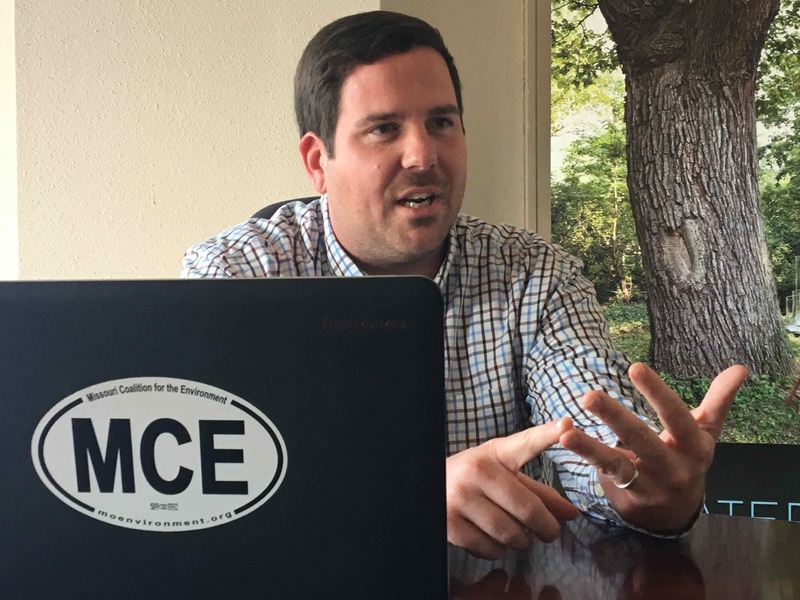 As MCE approaches their milestone 50-year anniversary of service in 2019, Ed and Maisah and the MCE staff, interns, board and allies continue hard at work protecting Missouri's water and air quality, open space and food access. 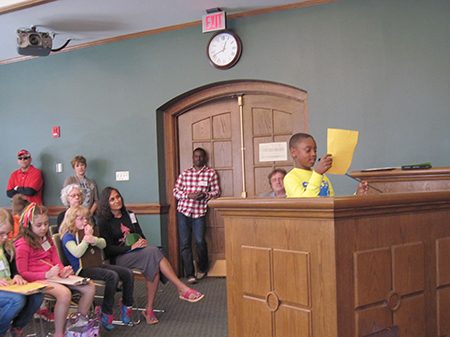 This is exemplary work - worth hearing! In a downtown office building, entrepreneurs work side by side with a visiting group of Tibetan monks. Business ideas are taking shape and a brilliantly vivid "painting" with sand is, literally, making peace. It's all in a week's work for innovation culture in St. Louis! 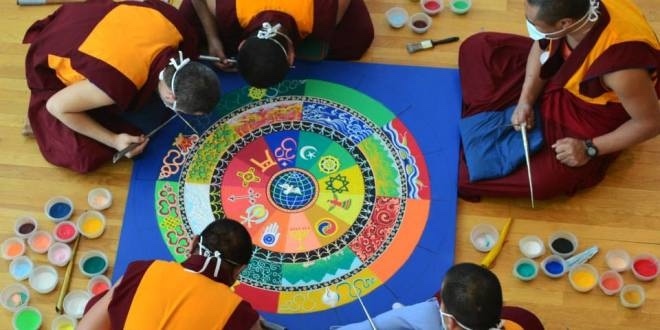 Earthworms' guest Geshe Monlam Gyatso and his fellow monks of the Drepung Gomang monastery are on a Sacred Arts Tour to U.S. cities. Earthworms' friend (and fellow guest) Patty Maher is hosting this group, as she has with groups of monks for several years. 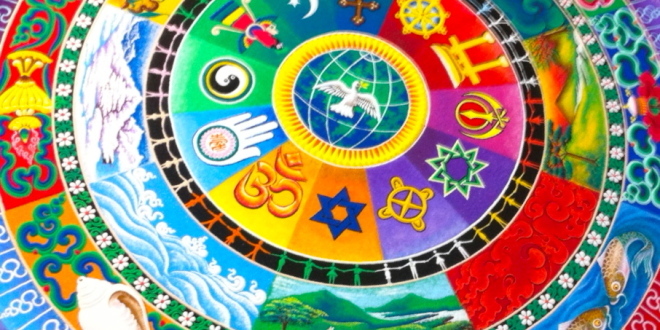 The T-Rex incubator welcomes their creation of a World Peace Mandala, Sept 25-30. On Friday Sept 30, the monks' Dissolution Ceremony will transform this beautiful work into a blessing of the waters of the Mississippi River in a ceremony everyone is welcome to attend. THANKS to Anna Holland, Earthworms' ace audio engineer. Batteries. We rely on them, we burn through them - some of us want to recycle them. The national Product Stewardship partnership Call2Recycle works with battery manufacturers to support "circular economy" management of resources in batteries, for us all. 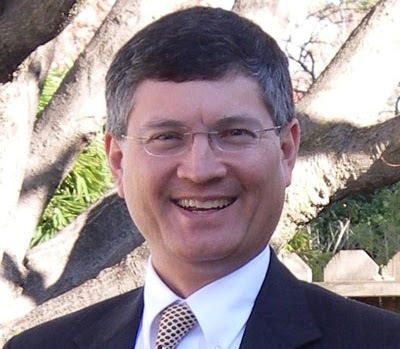 Tim Warren, Earthworms host Jean Ponzi's longtime recycling colleague, shares a thorough report on the what-why-how of battery recycling for the U.S. today. If you use power tools, a mobile phone, a laptop, a wristwatch or hearing aid, or drive a hybrid vehicle - or simply continue to use a flashlight - this update will be useful! 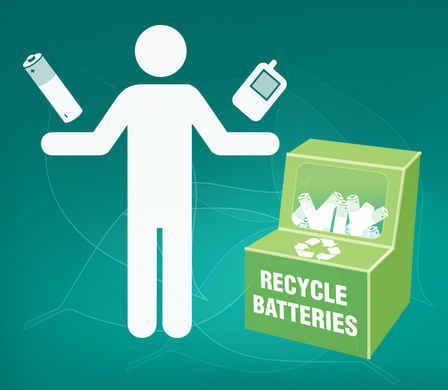 The Call2Recycle Locator can help you find a battery recycling option near you. 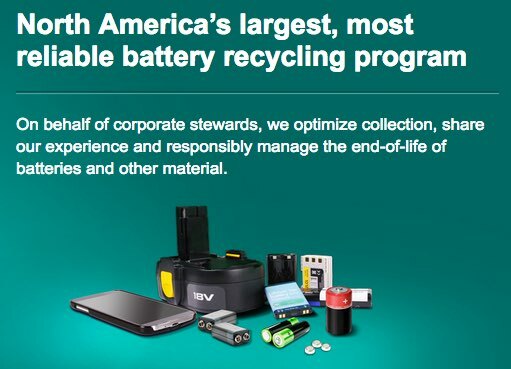 Check it out - and recycle your batteries, of all kinds! 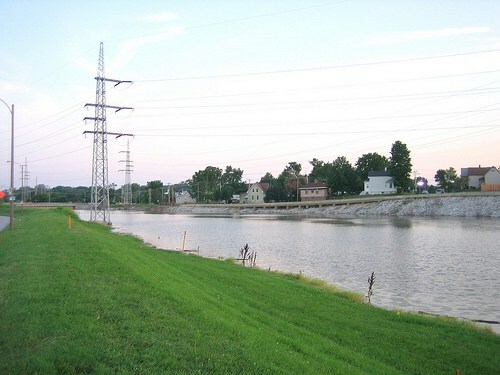 City of St. Louis and near-suburb residents might think "our" watershed is nothing more than a concrete drainage ditch. Theo Smith, coalition chair, and other members of the River Des Peres Watershed Coalition, see this urban waterway differently. 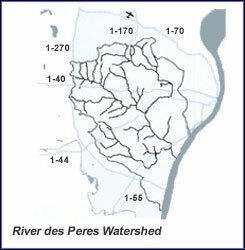 River Des Peres drains over 115 square miles in the City of St. Louis and nearest suburbs, before it joins the Mississippi River. 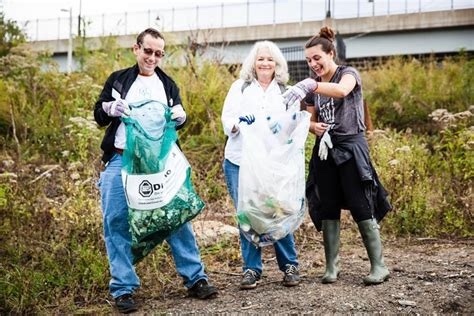 A coalition of Water quality and biodiversity advocates are joining together again this fall to raise awareness of the vital role of River Des Peres - and to pull out the trash that compromises its capacity in our regional watershed, overall. 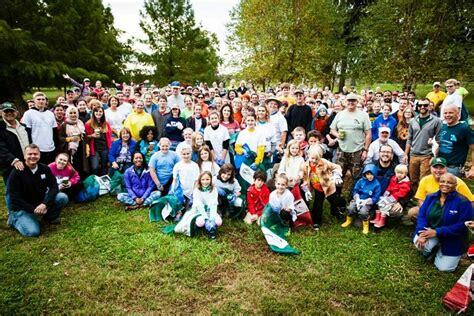 The River Des Peres Trash Bash will mobilize dozens of volunteers to support this waterway, on Saturday October 20, 2018, from 8 am to 2 pm. 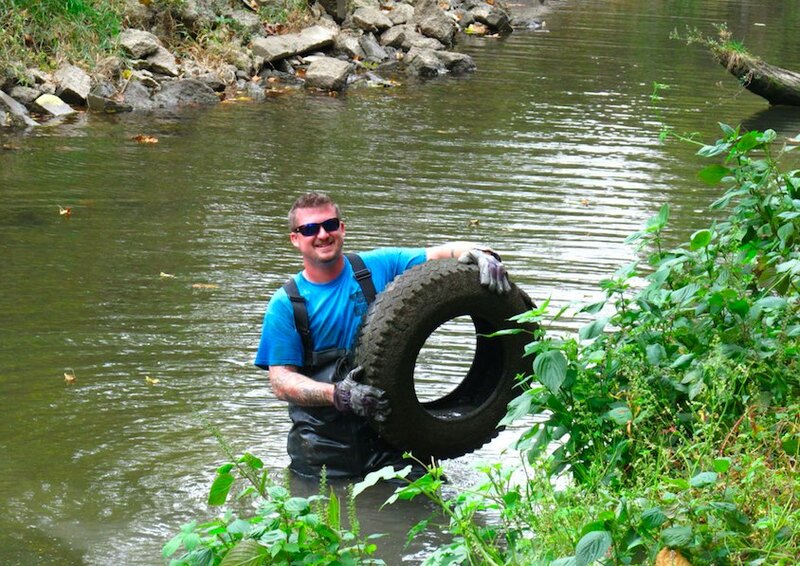 Results from 2017: Hardworking Trash Bash volunteers cleared 6.6 tons of trash from the rivers and creeks in the River des Peres watershed in just 3 hours! 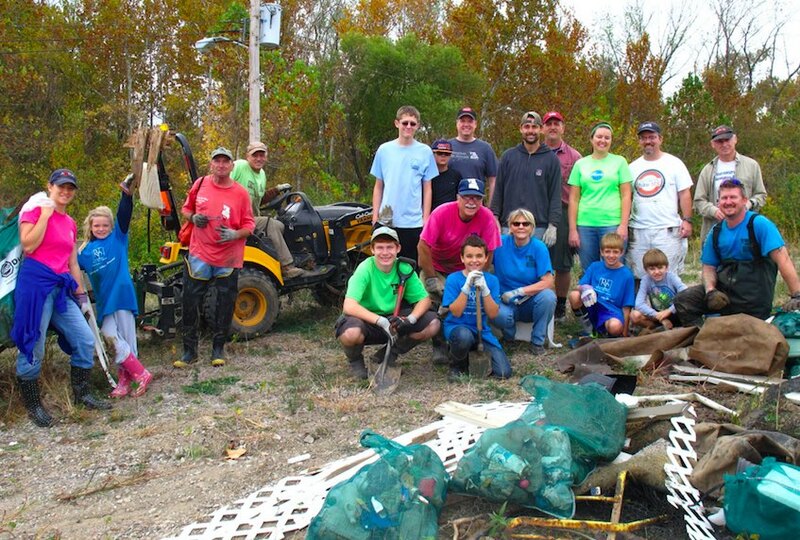 This tally includes 2.2 tons of scrap metal and 1.8 tons (101) of tires that were recycled! See yourself this year in this cadre of water quality champions! When a chance college dorm meeting prompts parlay about urban ag and life's design, can a live/work partnership based on decay, and inspired by nature, be far behind? In the everyday and enterprise of Tim Kiefer and Beth Grolmes-Kiefer, for sure YES. 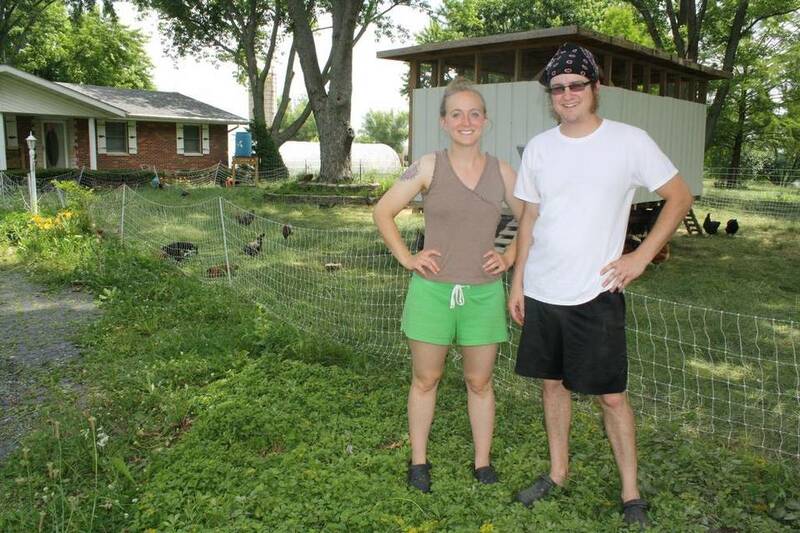 These two purposeful young sustainably-focused city residents are putting their ideals to work, raising and selling the outputs of hens, and transforming vacant property from poison-ivy infestation to rich-soil productivity. How? Primarily by collecting to rot the kitchen and garden scraps of others. 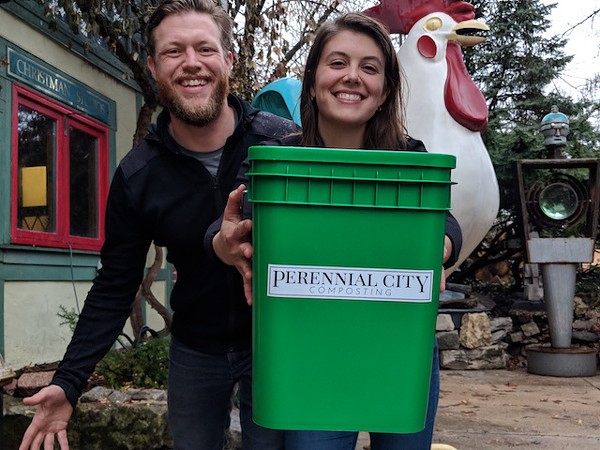 Perennial City Composting is a novel subscription service, providing St. Louis City and central-county area customers with regular organic waste pickup. Their on-the-road amenity feeds abandoned lot soil toward Tim and Beth's near-term goal of NOURISHing their subscribers with veggies from the composted scraps these same folks pay them to haul away. This Earthworms conversation spotlights the Kiefer's unique, hard-working and visionary efforts, while also enlightening Beth and Tim to options host Jean Ponzi knows from her STL work and previous shows. Listeners: Be ready to Rot & Roll! Earthworms is honored by engineering this week from Andy Coco, host of KDHX Rhythm Section and station Production Director. THANKS! 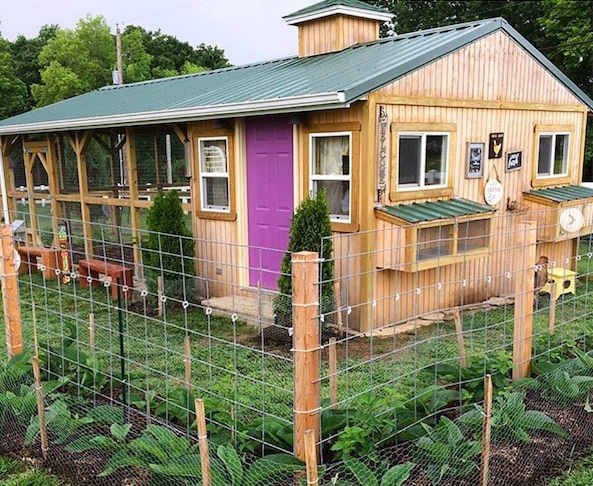 Alicia and Josh Davis are farmers (and both are, by training, engineers) on a plot they call Green Finned Hippy Farm, near Pocohontas, Illinois. They started life together, and their farming ambition, aquaponically raising ("green," finned) Tilapia fish. That was 2010. 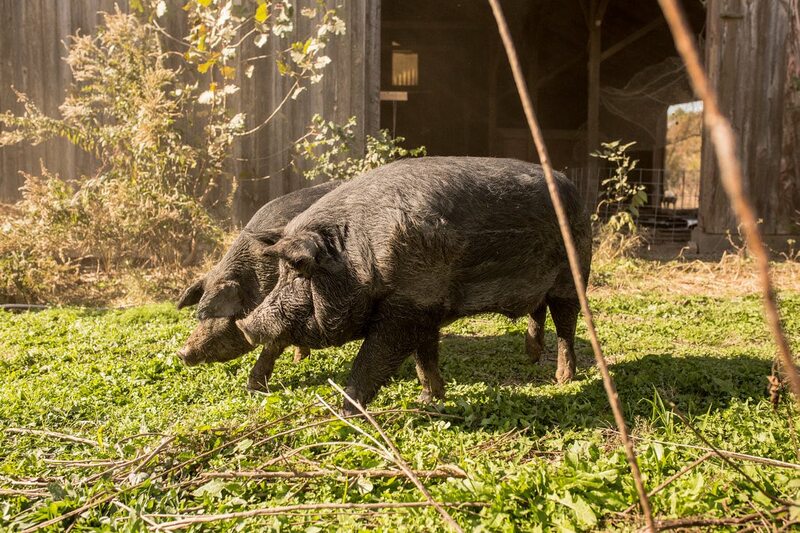 Today their rural 18 acres support hens in pasture, their family of three (son Bean was born there), organic veggie beds, and herds of goats and of the endangered heirloom American Mulefoot Hog. Resourceful and determined, Josh and Alicia are figuring out farming as they go - helped by the Internet and their family-farming heritage. 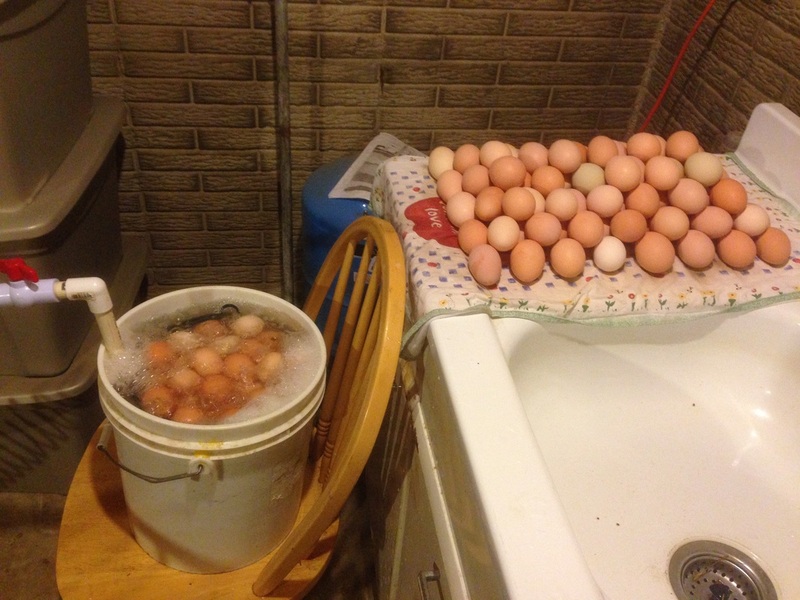 Innovations like their chicken truck and egg-washing apparatus continue to sprout, making their hard work more efficient. 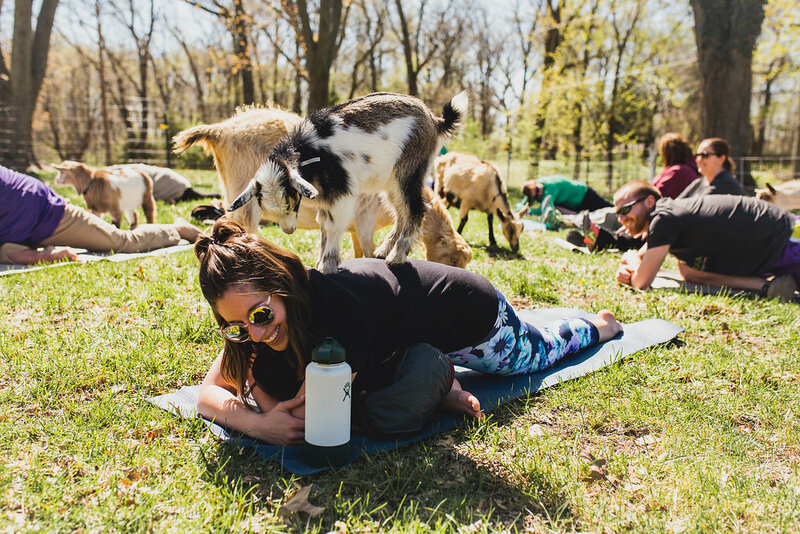 Farm events like Goat Yoga, Sips & Snuggles Baby Goat Happy Hour, and the truly sacramental Swine and Dine are growing their network of customers and friends. Where there are now is inspiring. Where they aspire to be in 10 years, Josh sums up: "I envision a community where we're Their Farmer, like someone is Their Doctor." Alicia adds: "Our hog program is a conservation effort. We selectively breed to produce excellent genetics. Our hope is that by humanely bringing this animal back to the table, we can remove it from the critically endangered list." Having this Earthworms conversation - and reading Josh and Alicia's blogs - I am in awe. These beautiful humans are working so hard to preserve and restore both a species of fellow living creature, and an essential way of life. Enjoy their story - and try their food!